We understand how to work with brands and networks worldwide to create memorable integrated spots. We're a full service production company that specializes in VFX and Design & Animation with the experience needed to navigate the most challenging multi-stakeholder projects. Look at all that junk in his trunk. Sounds like an HR nightmare unless you're shooting with an elephant that's not even there. This branded content spot for A&E + GEICO features a giant talking elephant as part of GEICO's "Surprising!" campaign. Director Steve Petersen worked with the actors to believably interact with a fully CG elephant. Featuring realistic creature animation and comedy, this spot is a heavy contender. BIG MACHINE produced this spot as part of a trio of projects shot back-to-back for A+E Networks. When you have superpowers, everything is easy! This branded content spot for A&E + GEICO features a super villain with incredibly practical domestic powers as part of GEICO's "It’s Easy" campaign. Director Steve Petersen worked with the talent and our VFX team to come up with this very flashy and fun spot. BIG MACHINE produced this spot as part of a trio of projects shot back-to-back for A+E Networks. This follows a trio of tremendously successful spots we completed for GEICO and A&E last year. Fast, agile, armed with killer instincts and able to bite into anything. Sharks? No. BIG MACHINE. Everyone knows Shark Week, and now everyone knows who to go to when you need to combine heavy visual effects with comedy. BIG MACHINE Director Steve Petersen, helmed this campaign for Discovery and Dairy Queen which was produced, shot and edited by BIG MACHINE. With a proven history of delivering spots with eye-poppping visuals, BIG MACHINE was the perfect production agency to execute a battle on the high seas between two friends, two DQ Blizzards and a hungry shark. 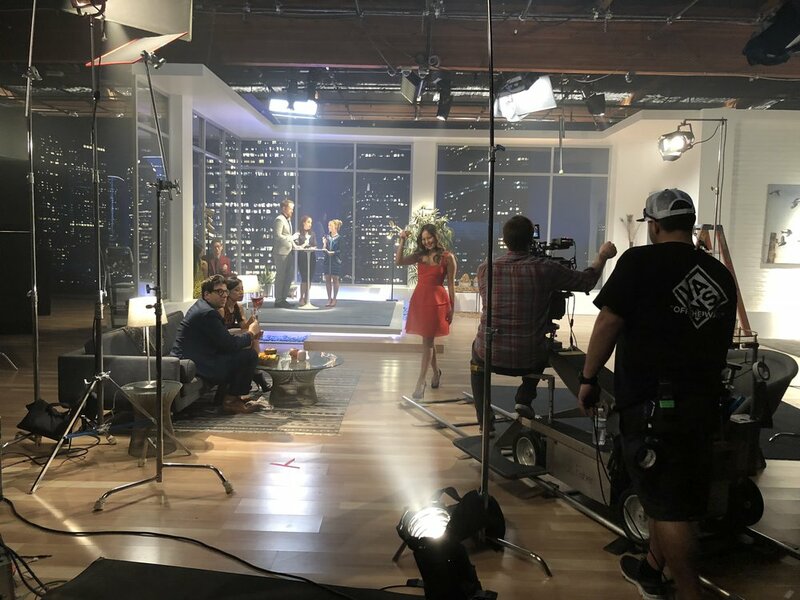 BIG MACHINE towed two boats into a soundstage in LA, and shot the talent on a giant green screen stage while crew members rocked the boats and splashed buckets of water on the willing talent. The ocean, skies and shark were all CG elements that were added in post. In addition to television spots, BIG MACHINE also delivered customized versions for Snapchat, Instagram and Thrillist..
BIG MACHINE is thrilled to have been part of the 30th anniversary of Shark Week. It's the cat's meow. In this parody of Project Runway the designers are getting into more than just catfights... they're designing cat couture. This branded content spot for Lifetime + GEICO features a parade of fashionable felines as part of GEICO's "Surprising!" campaign. Director Steve Petersen pounced on the opportunity to combine cuteness and comedy to create the purrfect spot. It cost about $25 Billion to put a man on the moon in 1969. BIG MACHINE just did it for a lot less. This branded content spot for History & GEICO features astronauts on the moon as part of GEICO's "Surprising!" campaign. Director Steve Petersen staged the moon landing in a Hollywood soundstage, just like another famous director! Featuring heavy VFX and a comedic turn, this spot is out of this world. Through the desert, snow, enchanted forests and rain, these knights brave the elements to complete their mission. But there must be an easier way! And there is: Carmax! BIG MACHINE produced, shot and edited this custom co-branded spot for History and Carmax on location at a Carmax in Burbank, CA and on a green screen stage. These knights are on a mission to find a treasure they must reclaim. The journey is treacherous, but they get some help from a surprising ally. BIG MACHINE director Steve Petersen has created a convincing period piece that takes a clever turn in this integrated spot for History and GIECO produced, shot and edited entirely by BIG MACHINE. Remember that feeling you got when you drove your first car? BIG MACHINE captured that pride of ownership in this humorous spot featuring a high school student and his new set of wheels as he cruises around town showing off just how cool he is. BIG MACHINE produced, shot and edited this custom co-branded spot for History's Car Week, a new week of car themed programming. GOLD RUSH / SUPERCUTS "SETUP"
Discovery strikes gold with this series of spots produced by BIG MACHINE. Featuring Gold Rush talent Mitch Blaschke, this partnership spot with Supercuts features the mechanic/miner getting ready to leave the Klondike to visit his wife at home. There's only one problem: Living on the claim has left him looking a little too rough for life back in the lower 50. Mitch uses the Supercuts app to schedule some tidying up. BIG MACHINE director Steve Petersen shot this spot in the Portland area after one of the largest snowstorms in recent history. The 2nd spot in this series reveals what happens when Mitch gets back home from being in Alaska. GOLD RUSH / SUPERCUTS "REVEAL"
Fearless, adventurous and powerful. Vikings? No, BIG MACHINE. It takes a certain kind of grit to produce a quick turnaround project that blends milkshakes with ocean-bound warriors. History once again selected BIG MACHINE to direct a spot merging its highly successful Vikings series with a mainstream American brand. In this case, BIG MACHINE director Steve Petersen tells the story of a treacherous journey that takes a tasty turn when a Viking crew is treated to Sonic shakes from a maiden on wheels. BIG MACHINE built a Viking ship on a soundstage in Los Angeles and used our expertise in post production to add stormy clouds and rain to create a dreary environment that would provide the perfect contrast to a Sonic-driven sunny day ending. Previous Vikings projects include 2 other spots for GEICO, one of which is nominated for a 2016 Promax Award. Take two hilarious improv actors and throw in an unbelievable collection of classic American muscle cars and you've got the winning ingredients for this History Car Week / Sonic Drive In integrated spot. BIG MACHINE produced, shot and edited this custom series of spots for History's Car Week, a new week of car themed programming. National Geographic and Farmers Insurance weren't playing brain games with BIG MACHINE when they asked for a sequel to several successful spots that we created for them a year earlier. This time around Nat Geo wanted to feature "Brain Games" and "Great Human Race" in these integrated spots with Farmers. Building upon the mini-macro world we created for the original spots we evolved the creative to feature more story-based animation. BIG MACHINE developed the concept of a mechanical word game for "Brain Games" and a natural history diorama hall for "Great Human Race." History Channel’s new show POWER & ICE is about the linemen who keep the power on in one of the most extreme climates on the planet – Alaska. Working hundreds of feet in the air in the middle of winter storms and brushing against thousands of volts of lethal electricity – these tough linemen risk their lives on a daily basis.. So it made sense for Dodge to team one of their toughest trucks up with this rugged show. The original creative had the hero Dodge truck driving through extreme winter weather, plowing through snow and helping the linemen complete their perilous missions. Only problem – after we flew the whole crew out to Alaska, the snow was gone, the locals were in shorts and there wasn’t a cloud in the sky! Because of the record heat the Alaskan locals even had to reschedule the famous Iditarod Dog Race for the first time ever. So BIG MACHINE looked to it’s visual effects team to bring the magic! We shot beautiful live action plates and brought the footage back to HQ to bring the story to life. In the spot GEICO’s popular gecko character is seen traversing the long table of a viking feast as he points out the difficulties of mobile phone communication in the 9th Century. BIG MACHINE Creative Director Steve Petersen directed this spot with a full cast of larger than life actors and a viking banquet hall that BIG MACHINE built on a soundstage in Los Angeles. History and Capital One selected BIG MACHINE to work some branded content magic for the anticipated miniseries “Houdini” staring Adrien Brody. BIG MACHINE director Steve Petersen had a real life magician hang upside down and perform a daring escape from chains wrapped around his body. Before OSHA gets called, don’t worry, it was done safely. BIG MACHINE worked with a stunt coordinator to plan and execute the illusion. Big kudos to our escape artist Seth Backus for delivering lines upside down! BIG MACHINE has also worked its magic, creating branded content for Discovery, National Geographic Channel, Bravo, A&E and Animal Planet. WE'VE PRODUCED SO MANY BRANDED SPOTS IT'S HARD TO FIT THEM ALL ON THIS SITE. HERE ARE SOME LINKS TO OTHERS!